This post is going to be a little how-to getting started guide for complete fashion newbies. If you are into fashion and a regular reader of INTO MIND, feel free to skip this one! Every once in a while I get an email from a complete fashion newbie. Someone who has never been interested in clothes at all and never really paid much attention to what they wore, but who now wants to change that and improve their sense of style, or simply just dress better. They usually mention feeling excited, yes, but also completely overwhelmed. If you are starting from zero, the world of fashion can seem like a hugely complex and strange place, with millions of unspoken rules and way too many options. "Getting started with fashion feels like being in a foreign country where you don’t speak the language. Everyone else seems to already instinctually know how to put together outfits that look great and find clothes they like. But how they do that? I have no idea!" I love the comparison between dressing well and speaking a foreign language. Because the great thing about developing a sense of style is this: It’s not something you need to be born with. It’s a skill like any other, that can be learned like any other. All it takes is a little practice. So if you feel like a total beginner, it may seem like everyone else around you has a natural eye for fashion, but in reality they’ve just been practicing for longer than you have. Most people start paying attention to what they wear pretty early on. I remember caring A LOT about my clothes in middle school, and most of my friends did too. If you have zero experience in the style department, you just have to catch up! In this post I'll show you four concrete techniques that will help you do just that. Note: Your goals at this stage should be above all to observe, develop a better understanding for the different aspects of an outfit and how they all work together, plus get a feeling for what kinds of things you are personally drawn to, so don't worry too much about defining your personal style or streamlining your wardrobe just yet. Wait until you feel confident about putting together outfits and have a good awareness of what kinds of things you like and why, before you tackle a full-on wardrobe revamp (check out this 10 Step Wardrobe Revamp or the INTO MIND workbook for help with that). The number one thing you can do to improve your sense of style and train your eye is this: look at how other people are doing it! What types of pieces are they wearing, what colours do they mix, what shoes do they pair with their outfits, how do they accessorise and so on. Pretend you are a researcher in a foreign culture and are trying to find out as much as possible about the local customs. Use your everyday environment as your lab: Sit in a cafe and just watch people passing by, pay close attention to your co-workers' and friends’ outfits and check out what your fellow commuters are wearing on your train ride to work (in a non-creepy way of course :)). Use Pinterest and fashion blogs to supplement your real-life studies and expose yourself to a broader range of styles. The key throughout this whole process is to be as precise as possible. If you see an outfit that you like, figure out what exactly makes it so great. Is it the overall vibe of the look (e.g. preppy, bohemian or minimalist), the colour scheme or a specific piece? Let’s say the two pics above caught your attention. Was it because of the neutral colours? The simple lines? 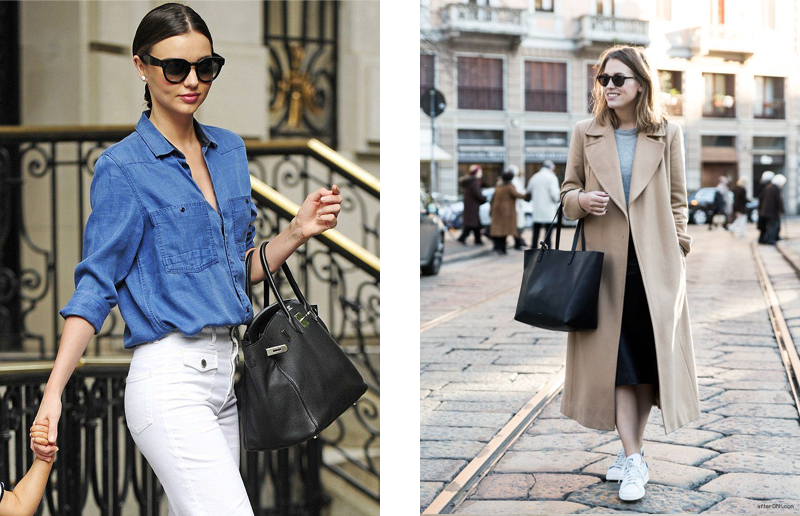 Do you just like big sun glasses and black tote bags? That is how you train your eye, by observing and paying close attention to how other people wear clothes and what types of things resonate with you and which don’t. It’s super basic, but if you ask them about it, people who have a great style and are ‘into fashion’ will probably tell you that they do this already, and have been doing so for years. Over time, you will get more and more of a feel for what kinds of clothes you like and how you like them to fit, and can then use that information to upgrade your wardrobe, either by wearing your existing clothes in a new way or by adding some new pieces. How do students in art school learn their craft? Correct: By studying and copying the styles of other artists. I know, I know, I’m usually all about ‘developing your own unique style’ and ignoring other people’s rules. But: For a complete beginner, imitating others can be a super helpful creative technique, because it gives you a concrete blueprint that you can use as a starting point. Most fashion newbies that email me mention feeling overwhelmed and just plain confused. They know they need to experiment, but don’t know where to start. My advice is always the same: Imitate! Pick one outfit and copy it. Then assess what you like/don’t like about it, rinse and repeat. Find an outfit on Pinterest or on a fashion blog that you could imagine wearing for one of your regular day-to-day activities, for example to work or on the weekends. Then, use your own clothes to replicate that outfit as closely as possible, or go into a store and try stuff on. By trying to copy an outfit as perfectly as possible, you are forced to really pay attention to details, like the fit of the pieces and how they work together to create the overall silhouette of the outfit. When it comes to fashion, details like that matter. For example, the two outfits above both consist of a white t-shirt, jeans and a brown belt. But the cut and fit of those pieces, and therefore also the silhouette and overall vibe of the outfit, is completely different. On top of that imitating is also simply a great way to experiment and hone in on your individual likes. In the best case scenario you love your copied look and have discovered a new favourite that you’ll want to wear all the time (go ahead, outfits aren’t copyrighted). And if you don’t like the outfit on yourself, you can use that as an opportunity to learn more about your style too, by trying to figure out exactly what it is you don’t like about it. The fit of the pieces, the colours, the materials? Can you think of a way to tweak it to make it better? Are there any aspects you do like about the look? How could you incorporate into your wardrobe? Here on INTO MIND I talk a lot about defining your own personal style and building your wardrobe around it. If you are a fashion newbie, that may sound like an impossible task. How are you supposed to know whether you prefer bright colours vs. neutrals or feel best in flow-y bohemian pieces vs. tailored separates? Here’s how: You try it out. The only way to ever get to a place where you can confidently say, yes this is my style is by exposing yourself to a ton of different aesthetics and experimenting, to find out what you like, as well as all the things you don’t like. Everyone you see who has a great sense of style right now has gone through this experimentation phase at some point in their lives and could likely tell you millions os stories about all the ‘terrible’ outfits they wore before they finally settled on a style. As a total fashion newbie, you can do your best to speed up that process, but you still need to go through it. My advice: Make it fun, but effective. Actively seek out new styles, colours and silhouettes that are outside of your typical comfort zone, all for the sake of research. Set the stakes super low to avoid overwhelm: Go into stores just to try on a bunch of stuff, take mental or actual notes of what you like/dislike and leave again without buying anything. A helpful way to push yourself out of your comfort zone is to set yourself little challenges. For example, go into a store you have never bought anything from and challenge yourself to find a complete outfit that you like and would wear. Or try on that one piece that you love on other people but think you can’t pull off yourself, and see if you can build an outfit around it. For lots more challenges, check out this post: 50 ways to break out of a style rut & feel inspired again. As a first step, figure out what separates your favourites from the rest of your clothes, i.e. why you wear them more often. Think colours, fabric, fit/silhouette, overall style and details. Again, make sure you are precise at this point. Instead of settling at ‘I like that pair of pants because it’s comfortable and has a nice fit’, find out what exact feature of the piece makes it so comfortable and well-fitting. The all-natural material, the high waist, the thicker fabric? Once you have defined what you like about your favourite pieces, you’ll be left with a detailed list of things that are all your style and that you can use a guide while out shopping. Since you have been wearing all of those things for a while already, there is a much lower risk that you’ll buy something that will end up un-worn at the back of your closet. Another thing you can do is to do a little online research to see how other people are styling your most-worn pieces. Let’s say one of your wardrobe favourites is a simple mariniere/ striped top. Type in “Striped top” on Pinterest or Google Images, … et voilà: a whole set of new outfit ideas to experiment with. Image credits: INTO MIND (top photo), Runway & Beauty (Miranda Kerr), afterDRK, via Fashionmagazine.com, unknown, WhoWhatWear, unknown. INTO MIND is looking for a production assistant!